At Liftman, we provide the Cherry Picker, Boom or Spider Lift AND the Operator to help you get to those little jobs in hard to get to places. From changing a security light, trimming a tree to cleaning or painting a building, Liftman gets you there! No obligation Cherry Picker & Boom Lift quotes and advice, so discuss your hire requirements with us today. 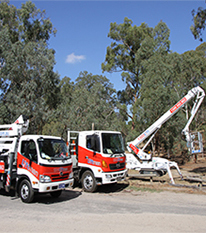 From small Truck Mounted Cherry Pickers to narrow access Spider Lifts, we provide affordable and user friendly services to help you complete all of your elevated works. Note: We can offer advice and are happy to provide information that you may require. However, it is your responsibility to obtain all necessary permits to complete your works.